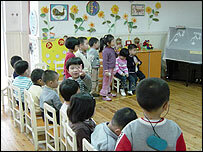 In a Shanghai school room bright with children's drawings, a class of five-year-olds sat on tiny chairs. But instead of heading home after their activities and music, 60 of the 200 pupils sleep there too, as boarders. A small but growing number of China's emerging middle class are putting children as young as two in boarding kindergartens. Parents say they are too busy to look after them, or keen for them to get ahead. The school's principal, Shang Shangu, said the boarding experience fostered abilities in the children which day attendance was not necessarily able to do. "The boarders are more street-wise and more independent," she said. These are qualities that educators hope will serve the children well in modern China, as the free market becomes ever more dominant and people are increasingly responsible for their own career choices and fortunes. "In order for them to be able to compete, we need to help them build up their self-respect and self-confidence," said Ms Shang. 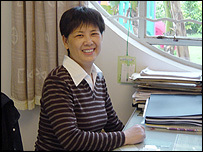 Her kindergarten, one of a number of bilingual ones in Shanghai, takes children from age two to seven. It operates a system under which children can award themselves stars, or be awarded stars by other children, for significant achievements. One of the parents is Chen Quandai, a 42-year-old engineer. As he arrived to pick up his son Zhengyuan, Mr Chen explained that although his wife did not work outside their home, the couple decided to board Zhengyuan at the kindergarten so he could "become more lively and fun". A few minutes later, Wang Ruijian, an economist for a construction company, arrived to fetch her seven-year-old daughter Lihong. "She was quite outgoing before, but now she's even better," said Ms Wang. She added that because she and her husband had to travel frequently, they felt that placing their daughter at the kindergarten was the best option. "But I miss her," Ms Wang admitted. Boarding kindergartens are a growing phenomenon in China - there are at least 20 where all or some children board in Shanghai alone. But they are not a new development. One of Shanghai's earliest and most prestigious ones, the Weihai Kindergarten, was founded in 1951. "I think there are several reasons for parents to put their kids in boarding kindergartens," said Xu Peiyan, a teacher there. "The most important reason is they are busy with work and don't have time to take care of the kids," he said. "Secondly, there are more and more divorced parents, and grandparents are too old to take care of the grandchildren." He said the fact that more and more boarding kindergartens were appearing in Shanghai, even though the birth rate was decreasing, showed that people trusted the boarding kindergartens. There is a definite anxiety about the effects of strict birth control policies in creating a generation of predominantly only children, although parents and teachers deny this is the main reason for the boarding kindergarten vogue. This kind of education does not come cheap, with a number of kindergartens charging parents between 1400 and 2000 yuan ($170-240) per month, more than many Chinese earn. Some people are yet to be convinced of the merits of these institutions. Sang Biao, an associate professor of psychology at East China Normal University, said: "In my opinion, the disadvantages outweigh the advantages." 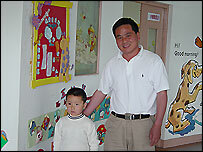 Boarding kindergarten children are at an age where they "need their parents' love and care," said Dr Sang. "The conditions in the boarding kindergarten are quite good, but one teacher needs to take care of several kids, thus the kids get less care than at home," he said. "The parents think the kids in the boarding kindergarten will learn more knowledge and get more skills, but it's no good for the development of their personality and emotions."